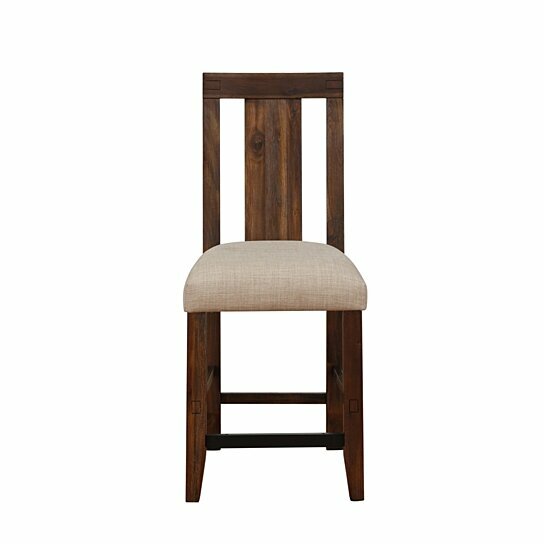 Add a rustic touch to your dining space with this Counter Height Stool. Crafted from solid wood in a brick brown finish, this stool features an ergonomically curved panel back and a fabric upholstered cushioned seat to keep you and your guests comfortable during your dinner parties or game nights. Completed with exposed joints and all round stretchers, this stool will form an ideal option for any rustic farmhouse inspired dining room, kitchen or living room. Note: Includes one Counter Height Stool only. The stool features a panel back design with exposed joints. The stool is bolstered by stretcher that doubles as footrest.